Last week, Hubs and I weren’t home. It was the first time being away from our (“finished”) house, and I have to admit how much I simply missed being here! Hubs was traveling for work and since I work from home and can technically work anywhere with an internet connections, I went with him and spent my time in the hotel and at Panera, just using up free wi-fi and eating cinnamon crunch bagels. Yum. We squeezed in a short couple of days on the weekends for a little mini vacation in the midst of all that work stuff. But now that we’re back home, here are some things I noticed and have on my mind that I wanted to share with you all. 1. I love not living out of a suitcase. I did that during college a lot because I was living on campus during the week and driving back home to see Wyatt and my family and friends on the weekends. I hate wearing the same clothes over and over again because it’s easy and happens to be freshly washed so I don’t have to dig it out of my closet. I hate thinking of a shirt I want to wear, only to realize it’s back at home in my instead of packed in my suitcase. Plus, I’m great at packing to go on a trip, but I have the re-packing that has to occur every time we move locations or want to pick up the hotel room. I’m not so good at removing clothes from the suitcase without everything getting super messy in there. 2. I love our own bed. Enough said, right? 3. Those bagels, free breakfasts, and dinners out did a number on how well my jeans fit. Yikes. Let me be clear, I know I’m not fat, so this is not be saying that. It’s just me admitting (mostly to myself) that I need to spend a little time focusing on getting more active. I snuck in a few runs while we were gone, and we took one, super-steep hike, but I still feel like I’m at my “winter weight” already. I do believe bodies keep the weight they need to survive and maybe this is my body’s way of preparing me for a cold winter? Or maybe it’s my body’s way of motivating me to go run today. 4. I’m so lazy about my appearance at home by myself during the day. No makeup, messy hair, sweats and Wyatt’s hoodie with warm socks…it’s all so fabulous and yet, so embarrassing to see when I look in the mirror. Do us both a favor and call before stopping by for a visit, deal? 5. Christmas is getting closer! And that means Thanksgiving is really close, too! I remember how exciting this time of year was in college because it meant lots of time off from school was coming up. Now that Hubs and I work instead of go to school, it’s just great because it means lots of cuddling on the couch, visiting with friends and family, and eating yummy foods. That’s why I need to focus on number 3 above! 6. Work is work now. At first, all this freelance writing seemed sort of like I was simply playing at work, doing something I enjoyed, taking my time to get projects finished, and having a good time. Now, I’m still having a good time, but I’m busy! I worked my first two 8-hour days last week for this freelance gig and it was exciting and scary because time management is such a huge part of my day! I probably should be working right now, but I feel so bad about how I’ve been neglecting you all lately that I had to take some time to catch up. 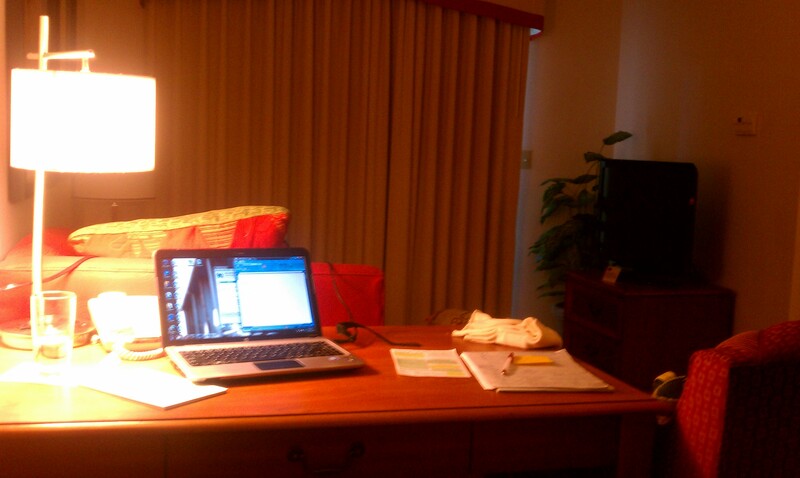 My little “office” in our hotel room for the week. It was as big as our apartment! 7. 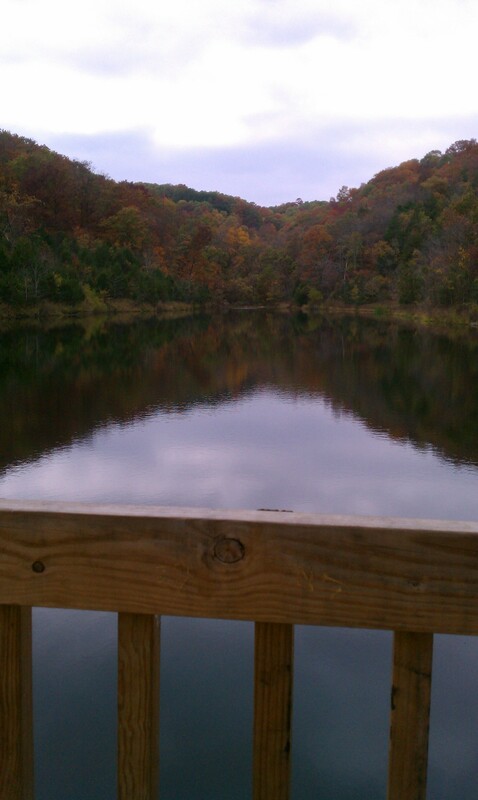 I love southern Missouri. Yes, some people think Branson is cheesy and corny and not at all relaxing or fun. I say those people have never been to the Branson I know and love. Local diners for breakfast, beautiful views, nature trails, antique stores, shopping (if we want it), familiar (but not what we have at home) restaurants, and that smell. To me, the air smells a little sweet, almost like a mixture between maple syrup and crisp freshness, and dusty, fall leaves. It makes me feel peaceful and happy and excited all at the same time. This doesn’t do it justice because it’s dark, but look how peaceful it is here! How can anyone not love a place like this? 8. Fall is possibly the best time for a road trip. 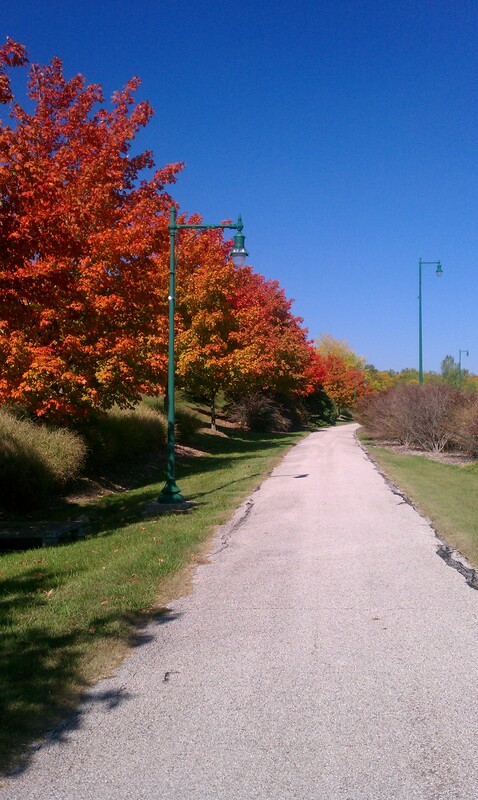 I love seeing all the leaves! The only thing I love more than fall leaves on road trips is Christmas lights on road trips. 9. Coming home to a clean house is SO worth the effort to clean it before you leave. I hate the feeling of stress that immediately hits me when I walk in the door and see dirty dishes, laundry, and clutter. Ick. 10. Hubs is certainly the only person I could ever imagine sharing this life with. He’s just wonderful. From the way he always wants me to pick the restaurant so I can have what I’m in the mood for to the fact that he loves to drive and I love to ride, traveling with him is always my favorite kind of adventure. Last week was stressful for him because of some long hours and hard tasks at work, so we didn’t get to have as much “fun” as I’d planned, but he’s still the best partner and friend I could have. Plus, he made up for all the not-so-fun times by being extra silly and special while we were together for those sweet moments at the end of each day. Okay, that’s enough for now. Why don’t you tell me some things that are on your mind? You don’t have to choose ten things…how about two!? Hubs is so lucky to have you! I actually do mostly large projects that take me a few weeks to complete. But there are some smaller ones, as well. I’d actually be interested in some smaller ones to help fill in the gaps when I don’t have a large project, but right now I’m pretty busy learning how to mange my time with all this new responsibility to meet deadlines and conduct my own research. (It’s like college, but in real life!) Glad you are also enjoying your working at home. Thanks! I try to stay as positive as possible! That’s awesome you do large projects! Is it for the business magazine you work for? If you don’t mind me asking, what exactly is a “large project” when it comes to writing? If you want smaller projects you should look into article writing! There’s always tons of postings available (I use the website http://www.freelancewritinggigs.com) daily. The thing I like about that is it normally only takes between 1-3 hours to complete, and I’m done! I sometimes do another / work ahead or I’ll take the baby out for the day and relax! A large project for me is typically 5-9 stories on one topic, at an average of about 450 words. Plus, I do all my own research. So coordinating interviews and writing all those stories takes time. Yes, it’s for the business publication I work for, and even though I enjoy it, interviewing all those people can be tiring! Good luck as you keep expanding your client base, and thanks for sharing the website! I can really relate to most of your points here. (maybe you and I are a little alike?) In particular numbers 7, 8, and especially number 9. Glad you had the chance to get away, but also happy for you to be back in your home sweet home. Love you! Love the bear comment. Is he wearing gloves? That places looks cool but definitely creepy. 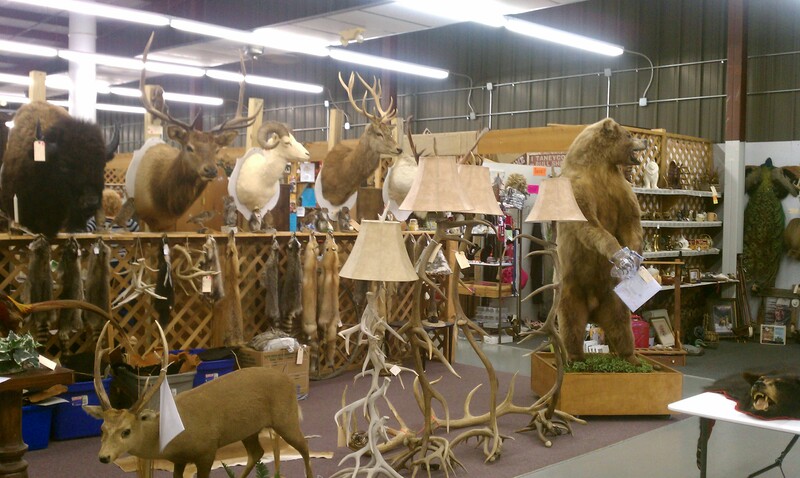 Wholesale taxidermy just sounds odd. He’s wearing plastic baggies on his hands. We assume it was because his claws were like 4 inches long! He gets #10 from his Dad. That is why I love our vacations so much! We always enjoy our “windshield time”. I am glad you are enjoying your home so much but also glad you got to get away together. Yup. I do love our crazy adventures together! Glad John passed that on!